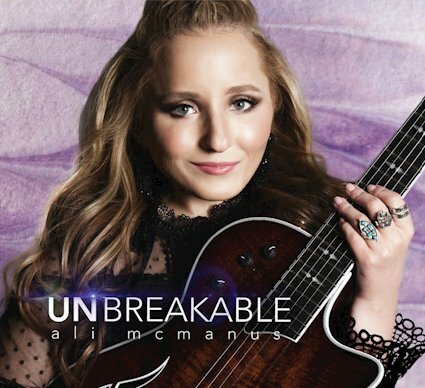 Album Review: Ali McManus, "Unbreakable"
More a “mini-album” than full-length (but I won’t split hairs here), Unbreakable is the very powerful and touching debut from Ali McManus, a 21-year old singer-songwriter/pianist/guitarist from Detroit. It says a lot when someone is doing a first release and they’re able to record with someone as legendary and respected as Jack Douglas (if I have to tell you, you don’t know your musical history…). As Mr. Douglas emphatically stated, “She’s a natural – a true artist with old soul sensibility and a powerful message to share with the world. For me and for the musicians, it was one of the greatest experiences.” Quite an endorsement. Of course, the quality of the performances and production goes hand in hand with the songwriting and is, simply, a stellar blend. The six songs Ms. McManus delivers are highly personal; all drawn from her thoughts and experiences, and you can quickly understand and feel the emotions in each track. The opening and title track, “Unbreakable” is so moving – the lyrics can easily reduce you to tears, let alone the melody: “…I am what I am/And I love where I stand/Yeah, I can’t stand for long/But I’m goin’ strong and I’m unbreak-able”, with the pronounced word being “able”. This has all the markings of being an anthem (which I would usually not been keen on, but in this instance, it’s poignant and meaningful) and the timbre of her voice veers between pure sweetness and elevates to heights that she doesn’t overreach, which is perfect for the song. “Rhythm That Rhymes” has a country feel – I love the crispness of the acoustic guitar, piano and quietly reverbed guitar; another lyrical call to arms and instantly says “radio hit”. “Wings” is the real stunner for me; Southern soul-styled, with Hammond B3, a groove and rich. The most salient element of these songs is that they’re all fully-formed; fully-realized and incredibly mature from someone who is just (really) beginning. And that’s impressive as well as hopeful. For if Ali McManus can continue on this road, she has many fine records to make ahead of her.